Peter Krasnow was an American artist born in the Ukraine, Russia to a Jewish family in August of 1886. As a boy he was an apprentice to his father, an interior decorator, and worked learning how to grind and blend colors. The impact of these formative years is what sparked Krasnow’s interest in art and is evidenced by the attention to color and design, in his work. The Ukraine offered no training in the field of art, so Peter Krasnow came to the United States in 1907 to Boston, later moving to Chicago where he attended the Art Institute. In Chicago he worked as a security officer and jobs of manual labor to put himself through school. It was there that he met his future wife Rose Bloom (1885-1984), a writer of poetry, short stories, and plays. Krasnow graduated from the Art Institute in 1916 and after marrying Rose they went to New York City “...inspired by vivid descriptions and promises of better opportunities” (Krasnow interview, 1975). The Krasnows, living in a tenement, quickly tired of the busy, sordid city. Krasnow felt the lack of nature in the urban environment and rented a studio outside the city and used the surrounding landscape as the subject for his paintings. His first exhibit of these landscapes at the Whitney Studio in New York attracted the attention of critics, one in particular who asked Krasnow if he had ever been to California. This casual question led to the eventual departure of Peter and Rose from the East coast to become West coast residents for the rest of their lives, excepting a 3 year sojourn to the Dordogne region of France. The Krasnows arrived in California in 1922 and in 1923 Peter built his own studio on land purchased from Edward Weston, the acclaimed photographer, who became a lifelong friend. A small group of artists in the 1920’s were trying to establish a community of California avant garde artists, Krasnow among them. 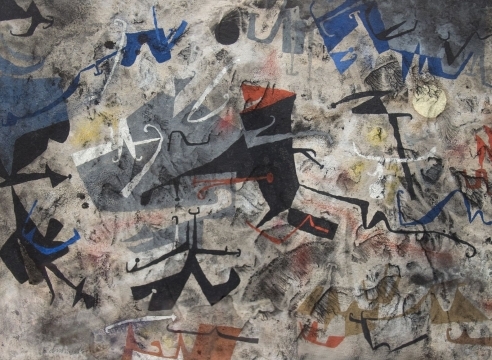 Other artists in Krasnow’s circle included Weston, painters S. MacDonald Wright, Nick Brigante, Boris Deutsch, Henrietta Shore, and Lorser Feitelson. Peter Krasnow received a $7,500 fellowship from the National Endowment for the Arts in 1977 toward the end of his career. Krasnow’s self-built studio in Glendale was the main residence of Peter and Rose for the rest of their lives. Peter Krasnow died in Los Angeles on October 30, 1979. Peter Krasnow’s early works are most often city scenes and the palette he used was rich and dark. These paintings echo the Ashcan artists with their urban subject matter. A street scene of a market in New York City (1919) could be mistaken for a market day in Russia. The women bundled and wrapped against the cold and the dark, brooding palette are suggestive of Krasnow’s formative years in the Ukraine. These early works incorporated contemporary surroundings of buildings and people, many of mothers with their children. After moving to California in the early 1920s, Krasnow’s palette lightens up. He created a number of landscape watercolors and other paintings that garnered him a successful exhibition at the Palace of the Legion of Honor in San Francisco. The success of that exhibition could have been a major catalyst for Krasnow’s career, but he chose instead to experience France, the art capital of the world, to further develop his work. After a short time in Paris he and Rose removed to the countryside of the Dordogne region of France and produced a series of watercolors and paintings of a landscape that “...just cried out to be painted” (Krasnow, 1975). He was given a rent-free space in which to paint. The citizens of the small town entreated the Krasnow’s to stay and become a permanent part of their community, but Krasnow knew he would need to return to California. The compromise with the townspeople was that he exhibit the works produced in their town before his return to the United States, which he did in Paris at the Galerie Pierre in 1934. Back in Los Angles, Krasnow spent approximately the next ten years producing wood sculptures he named “demountables”. His experience of wood sculpture in European museums was that the medium was difficult to distinguish from any other medium; the wood was not celebrated as an organic and generic product, but made to look like bronze or marble. Krasnow’s “demountables” are totemic figures of interconnecting geometric shapes. The intricacy of their configuration and the combinations of different grains and colors invite the viewer participation in understanding their interlocking patterns. They range in size from 24” to 119” high by 8” to 103” wide. These sculptures celebrated the knots and whorls within the wood, and ultimately the trees themselves, some of which came from Krasnow’s own property. In 1944 the war was in full swing and Krasnow turned back to painting. Within the dark days of war Krasnow’s goal was produce paintings of light. 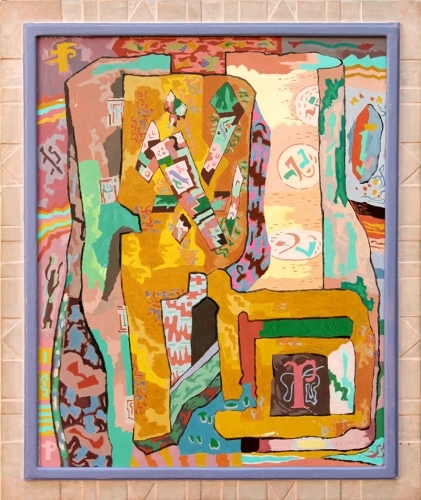 The paintings produced in the 1940s until his death in 1979 were colorful, geometric designs often incorporating abstract images taken from his Jewish heritage. The paintings are symmetrical with multicolored bands and rectangles creating order and light in a chaotic world. Krasnow’s paintings show a desire for structure and symmetry and have been compared to paintings by Piet Mondrian. 1. Karlstrom, Paul J. Archives of American Art Journal, 1997 (Volume 37 Numbers 3 and 4) P. 48. Smithsonian Institution,Washington, DC. 2. WIlson, William. Krasnow, 92: Anonymity from Fame. Los Angeles Times, November 4, 1979, Calendar, P. 5. 4. Tobey Moss Gallery, Los Angeles, CA. Exhibition catalogs 1986, 1989, 1991, 1993 and 1996. 5. Moss, Tobey. Peter Krasnow. ArtScene, September 1991 (Vol. 11, No. 1) p. 21-22. 6. Journal from t he Los Angeles Institute of Contemporary Art, December 1976 (no. 3). 7. Los Angeles Times Art Review, November 6, 1978. 8. Hughes, Edan Milton. Artists in California, p. 644. San Fran: Hughes Pub., 1989. 10. Mclelland, Gordon. California Watercolors; An Illustrated History and Biographical Dictionary. p. 144.